New discovery provides evidence for inherited power, points to complex culture. Archaeologist Julia Mayo works at a site called El Caño near the Pacific coast 90 miles southwest of Panama City. 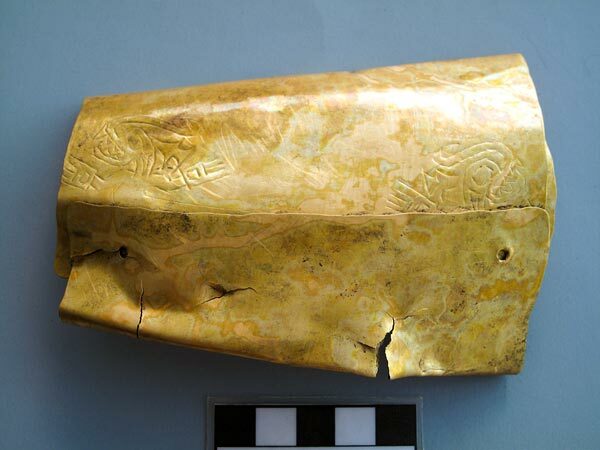 During five years of excavation, she has uncovered the burials of gold-laden chiefs from a still-unnamed civilization that flourished for several centuries before the Spanish arrived in the early 1500s. Now she can say how the chiefs got their power. The Spanish conquistadores who described this region told of great chiefs who warred almost constantly among themselves, leading their armies into battle to acquire territory and capture enemy warriors who would serve as their slaves. But how did those leaders move into a position of authority? Did they earn power through years of fierce fighting? Did they have to defeat the ruling chief? Or was power passed down through the generations of a dynasty? Mayo, a National Geographic research grantee, had those questions in mind as she began to excavate a large circular funerary pit from the pre-Hispanic era. She's exhumed more than three dozen individuals, and three offered an answer: Boys in this culture seem to have enjoyed rank and privilege from the moment of their birth. Her first clue came with a glimmer of gold that appeared in 2009. It was a tiny disk, almost foil thin, bearing the raised image of a crab-shaped creature with a forked tongue and a crocodile's claws. Beneath it lay two crushed cylinders, each embossed with what looked like a plumed serpent. Mayo was puzzled. She thought she was excavating a cemetery of warrior chiefs from A.D. 700 to 900, but she couldn't imagine how the three miniature pieces of gold might fit in. "At first I said, 'Oh, what bad luck! That disk is so small,'" she remembers. As Mayo surveyed the deepening excavation one day, the meaning of the artifacts suddenly came to her: They were so small because they belonged to a baby. A boy who was born to rule. He had been buried face down wearing the regalia of a chief—a breastplate and two cuffs that covered wrists crossed beneath a tiny chin. Clearly he hadn't lived long enough to earn his status, so wealth and power must have been handed down from father to son. But there was one problem: no bones. The boy must have been so young that his fragile remains hadn't survived in the acidic soil. As in a court of law, Mayo needed to produce proof of a body—habeas corpus—so she kept digging. In 2011 she found a similar group of gold ornaments—three breastplates, four arm cuffs, and two earrings—as well as a beaded necklace of green stones. But again, no bones. Finally, during Mayo's most recent field season, which ended late last month, she found the evidence she needed: gold arm cuffs, inscribed with images of the culture's crocodile god, which adorned the skeleton of someone young—a 12-year-old male, according to physical anthropologist Aioze Trujillo of the Universidad Complutense in Madrid. Close by lay the remains of a supreme chief. Discovered in 2011, he wore gold breastplates, beads, bells, mysterious figurines in fantastical shapes, and arm cuffs also inscribed with images of the crocodile god. Father and son? Mayo plans to do genetic tests to find out. But she's already convinced that the pair attests to inherited power. This has great implications for El Caño. "One of the characteristics of complex chiefdoms is that social status is passed down from father to son," she explains. That means this cemetery represents a society that was much more sophisticated than previously believed. It also means that this site helps build the case for the existence of complex pre-Hispanic cultures in the forests of Central America and northern South America. Unlike the Maya to the north and the Inca to the south, though, these cultures left no monumental stone architecture. Most of their material culture was biodegradable—houses of wood and wattle, roofs of thatch, baskets, mats, animal skins, feathers. But in this place, at least, people worked gold with great skill, and its shimmer endures as a testament to their centuries of prosperity and accomplishment.